Update: The poll is open! 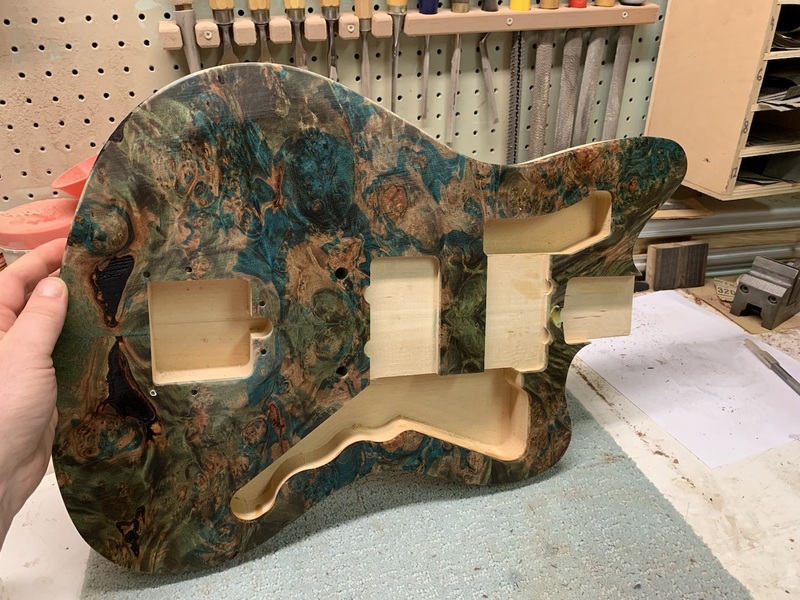 Awhile back I did a test run on my CNC to see how this double-dye stabilized burl stuff I've been making machines. 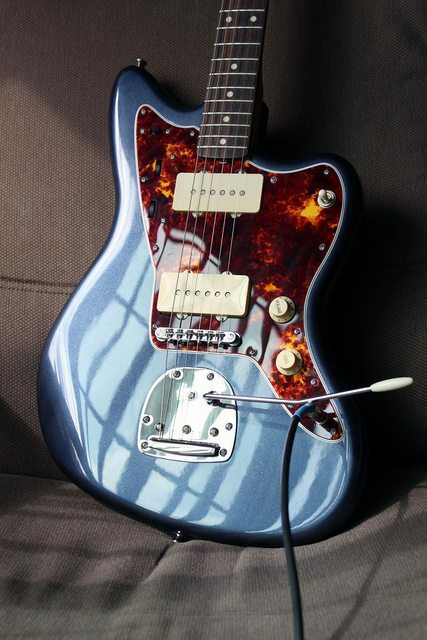 I used it as a test run to try out the Jazzmaster files I had created, as well. The pictures below are the result. However, since I don't build clones this truly was exactly that: a set of tests. 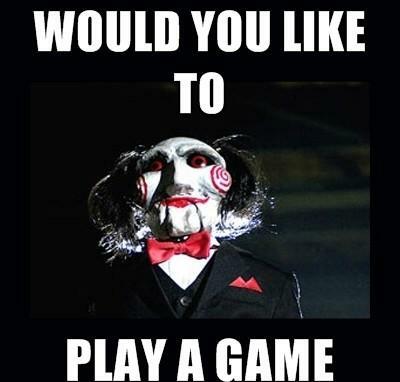 Therefore, since I have no use for it, I'm going to play a game! 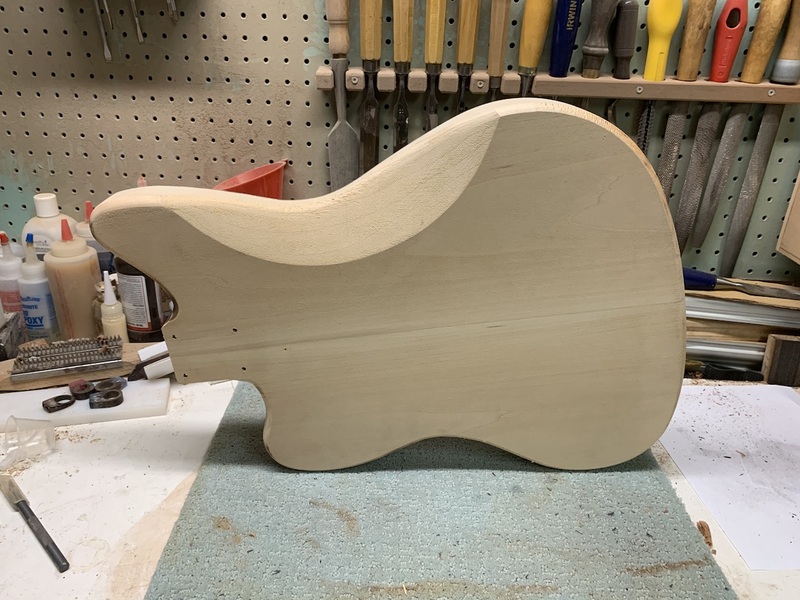 * Standard JM thickness, routing, etc. Last edited by verhoevenc on Sun Mar 17, 2019 4:56 am, edited 2 times in total. wow, that is cool top! I've been sticking to my short scale guitars lately, so i might not enter, but I really dig it! That's very nice, but whats the game? The rules of the game are labeled 1-5 in the OP. Good luck to everyone who enters. That should end up being a really cool build one way or the other. Rules updated to remove ConUS requirement. Don’t know why I put that in there... if someone is willing to have it shipped further, power to them! Wire it as a normal JM, no fancy stuff. 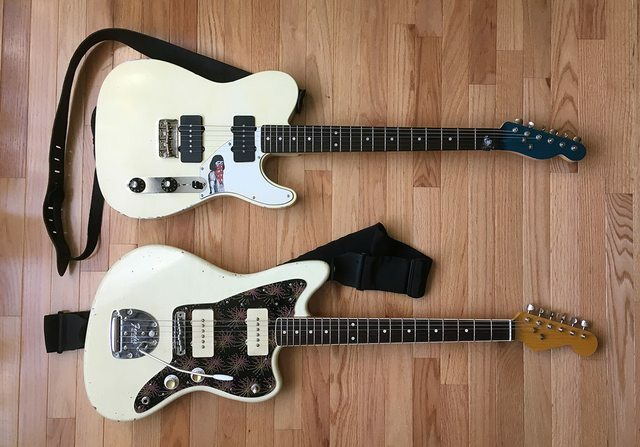 I would use a USA Fender trem & a Deed_Poll bridge if I could talk him out of one, if not I would do one of those custom bridges with tele barrels in it, haven't tried on and it sounds interesting. String it up with some flatwound stings and have some fun!! 2) I’d like to think I possess the ability, and I definitely have the desire! Two stunning beauties! I have thought about making colorful pickguards like that once - but never thought about the bodies before! Having access to various workshops (luthier friend, carpenter cousin, sculptor dad) finishing the project shouldn't be much of a problem. Specs: a B&B neck and a Staytrem-bridge are already at home waiting to be used! The actual shipping costs shouldn't be that bad to Europe (customs only apply if it's an item stated to cost more than 150€) - but as it is a give away this shouldn't be a problem either! So hell yeah, I'm entering! Nice idea! Thank you, Chris! EDIT: How do I match a headstock to these?! I'd possibly make it black to match the pickguard or leave it if it's gonna be a mint or parchment guard. That's a very generous offer and a cool game play. I have put together several parts caster and finished/refinished many guitars (necks and bodies). slightly higher concentration of dye for a rich color. - I would start with a hard-tail trem plate* with a possibility of switching to a traditional trem later. * Already have these parts/items - will post a pic later today. Below are some of the parts casters and finish work. Thanks for opening this up to outside of the US! Heres what I would do. 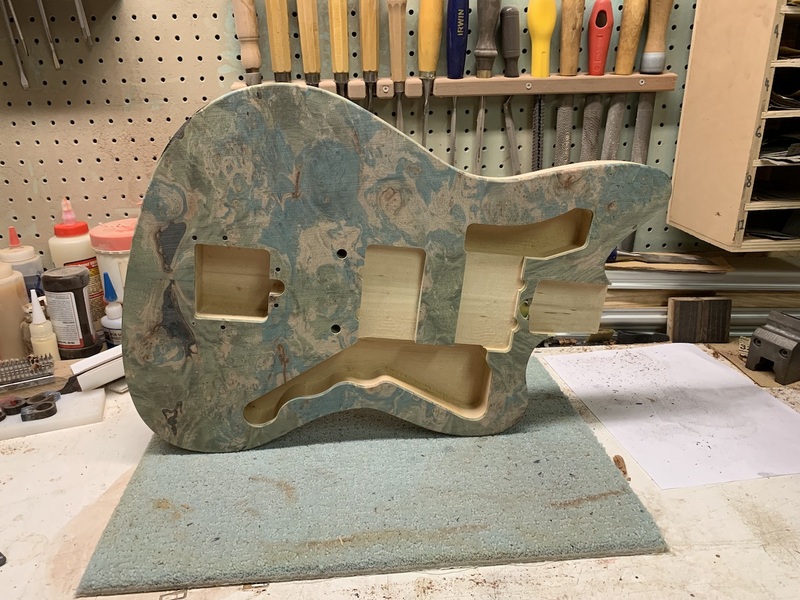 I've built a fair few guitars that have all had their progress documented on this forum over the years, most recently a blue Starcaster so I'd say I have the abilities to do what I had planned here. Dye the back a dark turquoise, with a slight burst keeping the edges darker. Back and top finish in tru-oil done to a soft shine. Gold anodized pickguard, most likely from a AVRI 62 unless theres a better source. Allparts neck and black painted headstock. Fender USA tremolo and mustang bridge. -stain the back a walnut brown. -a get custom custom semi translucent acrylic blue green pickguard (Deimel style). -all black hardware, possibly a black wilkinson roller bridge. -rosewood neck with a custom headstock and no fret markers (if possible). -Bootstrap custom pickup with a black cover.